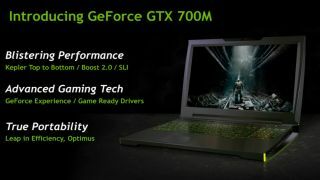 Nvidia is about to kill the notion that notebooks aren't for the gaming enthusiasts, unveiling its GeForce 700M series of GPUs. The new notebook GPUs are Kepler top to bottom, and all feature Nvidia's Boost 2.0 technology which adjusts GPU clock speeds to maximise performance. At the top of the range is the Geforce GTX 780M with 1,536 cores clocked at 823MHz, with a memory bus bandwidth of 256 bit and up to 4GB of GDDR5 memory. Memory here is clocked at 2,500MHz. All of which means 1080p gameplay should be nice and smooth. The 770M, meanwhile, boasts 960 cores clocked at 811MHz. The memory bandwidth sits at 192 bit, with 3GB of GDDR5 memory clocked at 2GHz. And at the other end of the scale, the GTX 760M and GTX 765M both host 768 cores, while the former is clocked at 657MHz and the later at 850MHz. Both have a 128 bit of also-GDDR5 memory with 2GB capacity at 2GHz. The new series also makes use of GeForce Experience, a client that will detect the CPU and GPU and then tweak and optimise in-game settings for the notebook you're running it on. Nvidia promises that the 700M series will bring notebooks that are 40% and lighter, delivering the enthusiast experience to the mobile gamer. "Our competitors are pretty far behind here in terms of performance penalties and the fact that their profiles aren't identifying correctly a lot of different games and applications out there. Optimus just works, it doesn't cost any performance," said Mark Aevermann, senior product manager for mobile GPUs. Speaking at the reveal event, Aevermann said that the GPUs will be targeting framerates of around 40fps, with the ability to go even higher than that in some isntances.